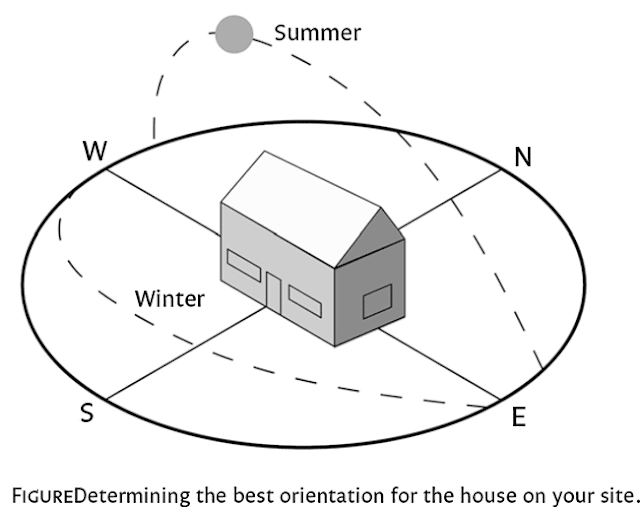 Selecting a site that has good solar orientation is one of the best strategies to lower your home’s operating costs. To determine the best way to orient your house based on this sun path, you need to figure out where you are on the planet. In the northern hemisphere, the sun is never in the northern sky, and it is either high in the sky (in the summer) or low toward the southern horizon (in the winter). We’ll take a rectangular box design to illustrate the best design for passive solar benefits. To achieve the best orientation of your home on the site, you’ll need to determine the sun path across the site, from east to west. Once you have charted the sun paths, you will need to determine if it is possible to design the home on the site with the long walls of the rectangle running east to west (“east- west axis”). It is important to recognize that the correct orientation of your house isn’t limited to which side of it faces the street. Which walls are the long or short walls will depend on how you design the home for the site. is could mean the front is a long wall if your site is facing south, or if your lot faces west, it could mean that the side wall facing south is now the focal point of a courtyard. Or maybe the house faces north and the back patio has large overhangs that serve as a passive solar feature. But if the site is on the north slope of a hill, having good solar orientation for your home is going to be a concern. e point is to make the best use of your site by designing for it.